I often write about the many animals that we keep, not only the daily chores and routines that revolve around them, but also the entertainment and companionship that they provide and I’m hoping that we will soon marvel at the wonder of birth when the new goats arrive. Meat eaters as we are we still care for the animals that we keep and a new litter of rabbits still makes the heart melt a little, despite a certain knowledge of their fate. Then there is the other animal, the one that sits motionless for years on end, slowly growing and occasionally giving birth to, I’m now sure what you would call it, a miniature duplicate. I only feed it every ten days or so, a diet that most would baulk at, but as long as its organic in it’s origin then it will happily eat as much as i give it. Occasionally this can lead to weight problems, normally resulting in the afore mentioned birthing process, but it’s offspring can more than deal with any excess food that we and our guests may produce. We did have an incident with egg shells, their ingenious structural makeup make them extremely difficult to digest, but the chickens eat them now so we have avoided a reoccurrence, and it would be true to say that sticks and other fibrous materials take a little longer breakdown than your average vegetable dish, but digest they do, over time. Picture form November 2015, after we killed the pigs. Just in case you are wondering what I’m talking about then the picture above should give you a clue and the picture below should give it away! 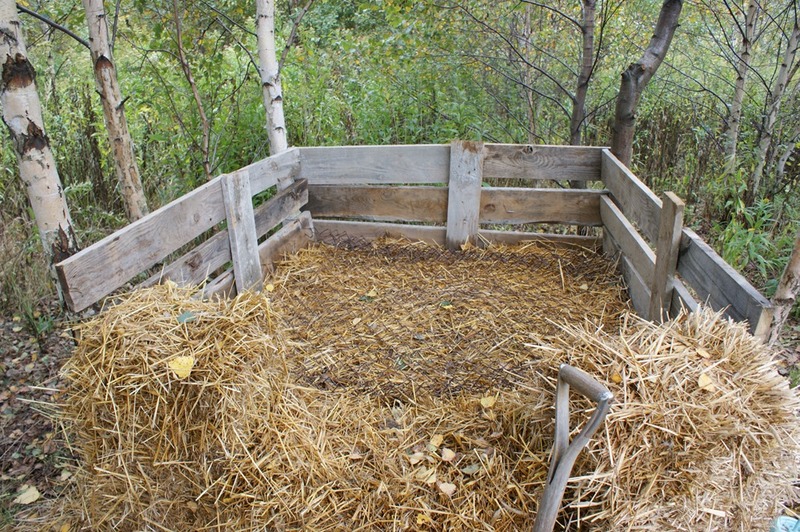 We are now in our sixth year of using a composting toilet and on our 6th pile, two of which have made it into the garden with a third waiting to go when we start planting the crops out later in the spring. That’s a lot water saved, a huge amount of chemicals that haven’t been added to the environment and a whole lot of rubbish that most people might throw away, turned into nutrient rice compost. One piece of advice, for anyone who decides to help save the world by letting nature do its thing: Wash your hands!! And what better way to do that than with one of Gosias handmade soaps! As you may be able to tell, I started writing this some time ago and never pushed the publish button, but now that I have to unashamedly plug Gosias soaps then I’ll take every opportunity I can. Your posts never fail to keep me entertained and interested. Cheers Vinnieh! I might even start writing a few more now I’m getting into the swing of it again. Hi Eddy! 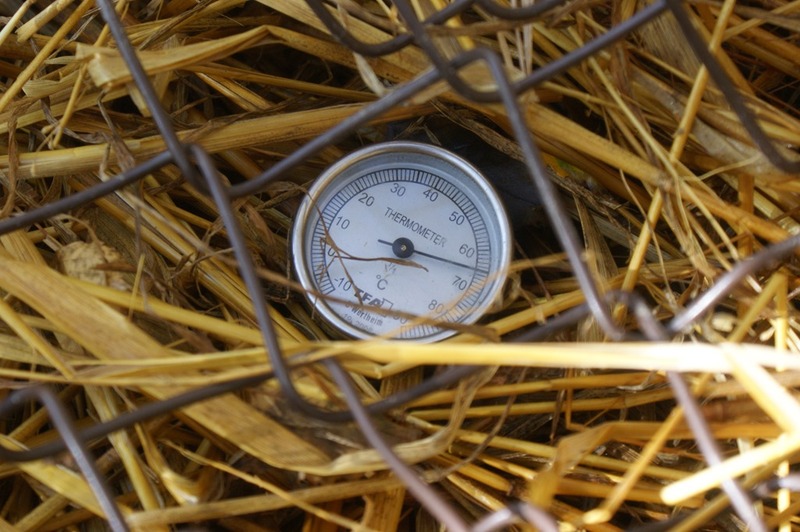 It’s fun to read about the adventures in composting of other folks! We’ve been doing the bucket system for about five years and it feels so normal now! I feel weird when I’m somewhere else and have to poop in water. I have yet to throw any meat scraps in yet due to fear of them being scavenged by a raccoon or opossum – which we have in abundance. Enjoy the Spring and watch out for shrooms soon! Great to hear from you! We visited friends recently and they had a bucket installed, I was thrilled 🙂 Hopefully it will catch on with a few other friends who are building straw bale, which is becoming a bit of a trend in the area. I do put a flexible wire chain fence over the top of the pile as we had a visiting dog that liked to have a dig, but we haven’t seen him since last year. Thankfully our dogs deter pretty much anything else from visiting. Eddy, please be careful when you’re dumping the buckets into the bin. That carnivorous compost might leap up and take your arm off. Wise words, mind you it’s probably already eaten a couple of times my body weight! “Carnivorous compost”—a title that begs reading! I really liked the humor in your article, and also appreciated the photos. Nice to see you’re blogging again after a lengthy hiatus! Thank you David and good to see you here. Hopefully I can sustain the momentum. You know just how long I have waited for that toilet update, Eddy! It’s a relief (in more ways than one) to find out that it is still working well, and hasn’t exploded yet. Vivat! Long Life! to the microbes! As a half-of-yours experienced humanure composter I may only confirm that 2 years ago a whole cat who decided to die at our allotment garden was burried in the pile and after 11 months there was no any single piece of bones discernible in the compost. btw. egg shells after drying may be added directly to the soil. We met someone recently who grinds the shells to a power and puts them in capsule then sells them! But our chicken appreciate a little bit of extra calcium in their diet so they get tossed in the mill when we prepare the grain for them. Next Next post: Early start, late finish.